Living Legacy Gardens depends upon fundraising events and donations to maintain and sustain the gardens. If you have visited us or would just like to make a tax-deductible contribution to a beautiful and educational garden, please follow the link below. We also would like to give you the opportunity to purchase an engraved paver for the Memorial Walkway that runs through a part of the perennial gardens. Granite pavers are engraved with a loved one’s name (living or deceased). If you have someone you wish to remember or honor with a paver, please contact our main office 218-894-5123. Thank you to all who contribute. The gardens wouldn’t be the same without your support. Every Tuesday morning from 9:00-11:00 A. M. throughout the summer months beginning in May and continuing through October volunteers from the community work as a team to maintain the gardens with student help from the Central Lakes College Ag Center. There is opportunities to dig in the dirt while pulling weeds, pruning various woody plants, planting new perennial and annual varieties as well as enjoying the beauty and peace of the gardens. Everyone is welcome, regardless of age or experience. Join a dedicated group of volunteers who come to have fun, socialize, and share their skills while helping to keep the gardens well maintained. Please contact the main office by phone 894-5123 or email Tammy Rick, trick@clcmn.edu, if you have any questions. This program is held 6 to 8 sessions throughout the summer for children in grades K-5. Vegetable gardens are planted and maintained by children. Project leaders plan garden activities and helpers are welcome. A favorite event is the last garden session where produce is harvested and various snacks and dishes are prepared from the produce for students to try and enjoy. Please contact Becky Roelofs via email meadowbrook@brainerd.net. Throughout the beautiful summer months, we give guided tours of the gardens by appointment through contacting Tammy Rick via email trick@clcmn.edu or the main office by phone 218-894-5123. This tour includes a history of the gardens and how it began. There is also the opportunity to ask questions about any plants that you find in the garden as well as growing conditions. We look forward to seeing you! Come visit us throughout all four beautiful seasons! The gardens are constantly changing throughout the seasons. The main gardens consist of sun-loving perennials, annuals, shrubs, and trees. There are also pollinator friendly gardens that hum throughout the warm summer months with the sweet music of the bees and the butterflies. We also have shade gardens comprised of hostas, bleeding hearts, ferns, and heucheras. The last section of our gardens is the herb gardens composed of sage, basil, thyme, mint, oregano, chicory, chives, and many more. The gardens are a beautiful site for photos or a time for rest and relaxation. Check out our brochure here (pdf) Please visit us any time free of charge and enjoy! To serve the horticulture needs of the people of Minnesota through innovative resourceful demonstration and education. 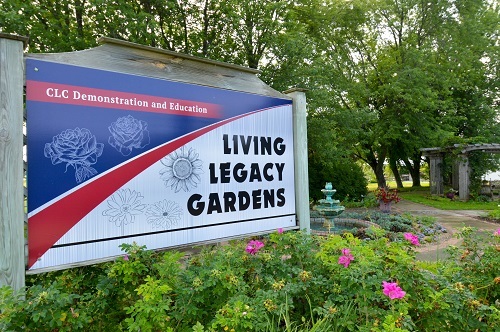 The Living Legacy Gardens are located at the Central Lakes College Ag and Energy Center of Staples, MN. The gardens began in 2000. It was started to demonstrate perennials, annuals, herbs, shrubs, vines, fruits, native plants, and trees hardy to USDA Zone 3. The landscape design was developed in collaboration with the University of Minnesota Landscape Design Program and Meadowbrook Landscaping professionals, along with community and student volunteers that have implemented the design to create beautiful and educational gardens.